Dogs should know all of these commands in every situation, both on leash and off leash. 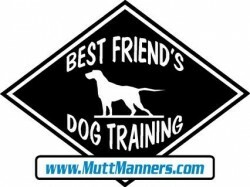 Best Friend's Dog Training will teach your dog these basic dog training commands. Your dog will follow all these commands during distractions and without food bribes. Really!Â We offer two options for basic obedience training.In Home Program This is where the trainer comes to the client's home and teaches in the dog's natural environment. It is often more convenient for the owner to have the trainer come to their home. For dogs that display undesirable behaviors in the home (counter surfing, running out the door, trying to eat the neighbor's cat...) this program is the way to go. Board and Train Program This is is a two-week boarding program that is followed up with private lessons in your home. This is our most popular and referred program. Your dog will be trained 2-3 times every day; in the home, outside, near shopping centers, around other dogs, squirrels, people, cars, etc. We require in-person follow up training sessions to ensure the training is long lasting and effective so the owners understand what to do. Learn more about Board and Train. Both programs above are eligible for our Lifetime Group Classes, so you can continue to expand your dog's skills and practice what you and your dog have learned in a supportive group environment. No other company offers these valuable assets, or backs them up with a team of trainers. We get calls all the time from people who said their dog had "failed" obedience school. The problem is usually not the dog, but what the other school failed to do is successfully teach the owner. This is a shame and a waste of money. Best Friend's Dog Training understands that telling someone to "do this," is not good enough. You need to understand why you are doing something.We know it takes some people longer than others to understand what is being taught. That's why we offer One Price for the Life of the Dog. Yes, you read that right! We will work with you and your dog until they have mastered the obedience skills, and you are welcome to attend our weekly group classes for the life of your dog. We have a team of dedicated, professional dog trainers and we know that not every method is right for every dog and owner. We are flexible and use a variety of techniques and strategies. You will never hit or yell at your dog. All "attention getting" techniques are done at very low levels and copious amounts of praise and love will be used to reinforce wanted behavior. Call or email us to set up a free evaluation in your home. You can ask us all the questions you want and there are no surprises.